Reservoir managers will decrease Dworshak Dam discharge flows from 5,000 cubic feet per second to 1,700 cfs today, according to a news release from the Army Corps of Engineers. The flow decrease was scheduled to begin shortly after midnight and is designed to help the reservoir refill. According to the release, the reservoir has ample space for flood-risk management. 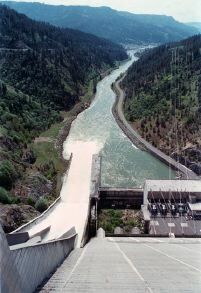 Additional changes in discharge flows may be necessary as rainfall and snowmelt conditions change. The decrease in flows exiting the dam is expected to have little effect on downstream water surface elevation in the Clearwater River because of anticipated increased streamflows throughout the Clearwater River basin.